The first time I visited the Baha’i Temple, about ten years ago, I said “Wow! This building is so symmetrical” and then didn’t think much of it afterwords. 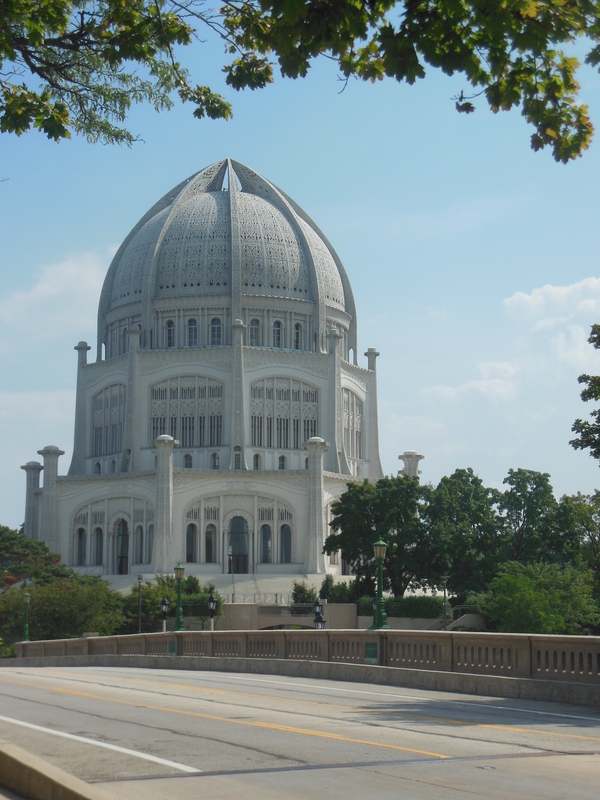 The Baha’i Temple is in Wilmette, IL, a short train ride North of Chicago. You can visit any day of the week for free (and they don’t take any donations from people outside the faith.) A visitor center with the aforementioned excellent bathrooms is at the foot of the temple. This is one of eight Baha’i Temples in the world and the only one in North American so it’s a bit of a tourist attraction. Designed by Canadian architect Louis Bourgeois, the temple took 32 years to complete, beginning in 1921, with construction halted during the Great Depression. 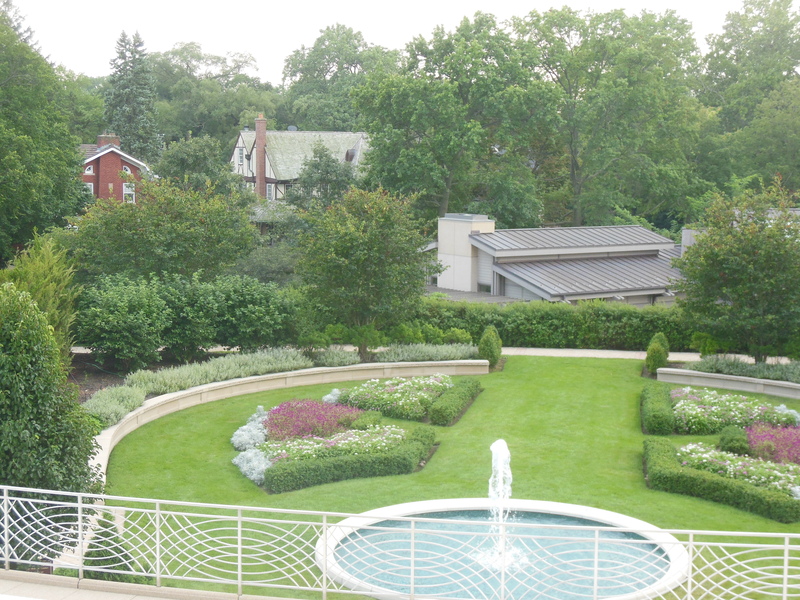 One of the nine gardens with—wait for it now—nine fountains. 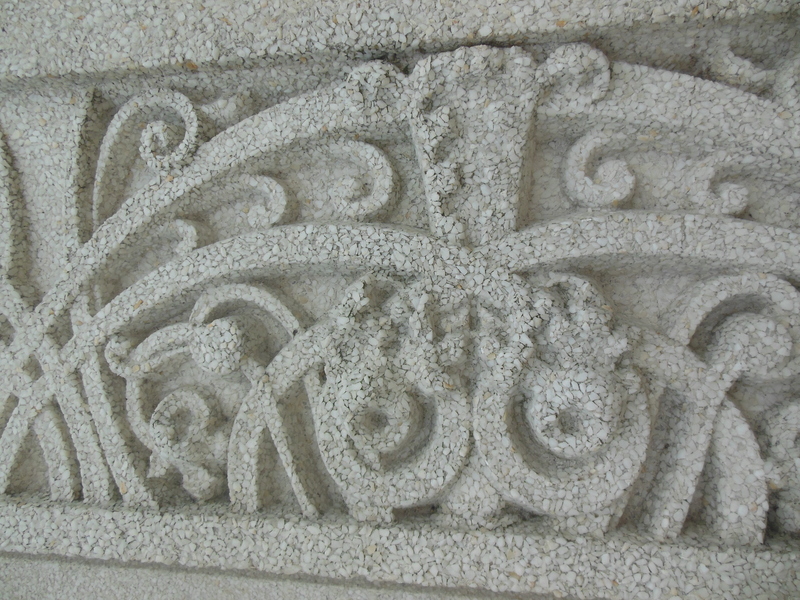 The building is constructed on a steel frame covered with white tracery made of concrete mixed with ground quartz. The design elements are eclectic with Gothic and Moorish bits, as well as ornamental details using symbols from several world religions. 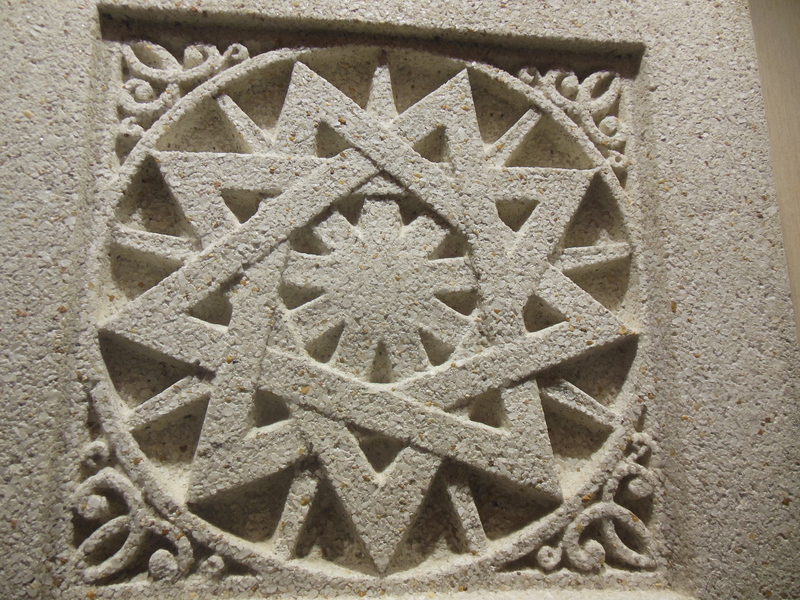 The, ahem, nine point star is in heavy rotation on the temple’s façade as well as in the interior (no photos allowed inside though). After hanging out around the temple for a while I got this feeling, the building design reminded me of….something. 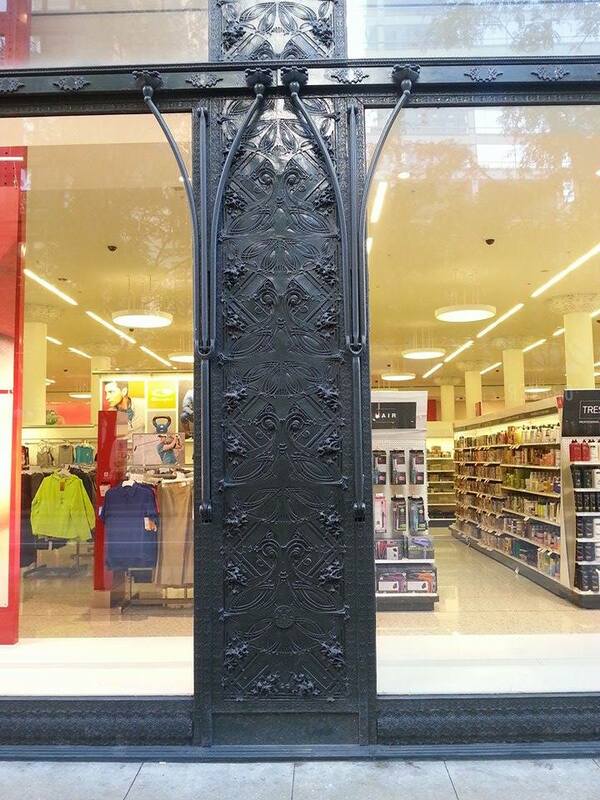 I thought at first it was the Louis Sullivan style of decoration, well known in Chicago architecture. 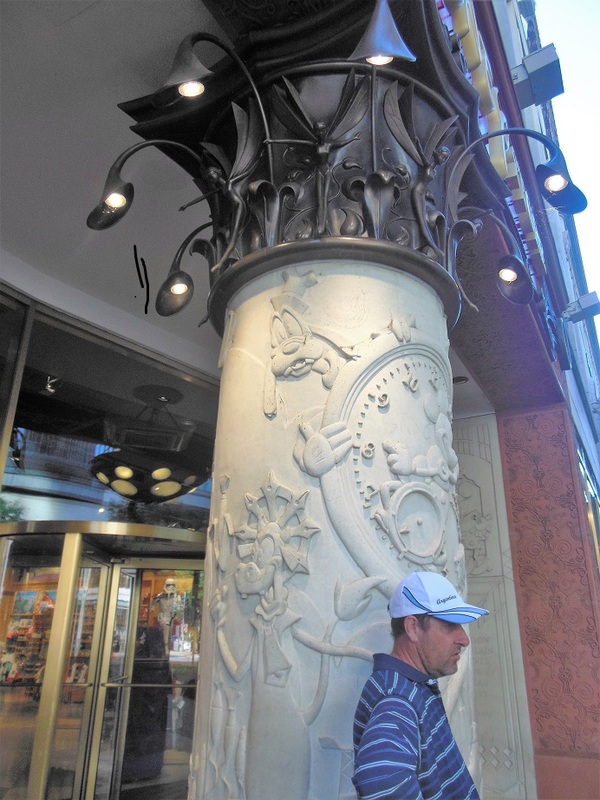 (See above for a detail of his Carson, Pirie, Scott building). 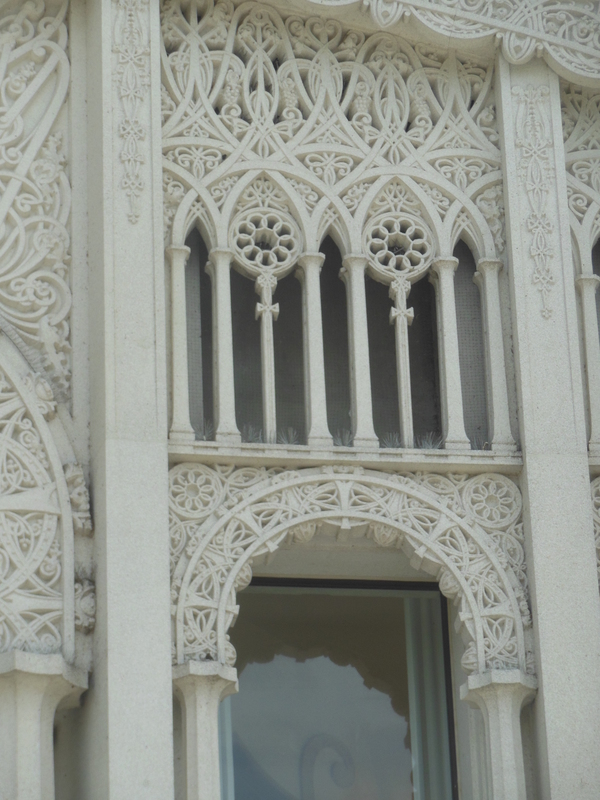 Though, on consideration, it wasn’t the Louis Sullivan style I was thinking of. 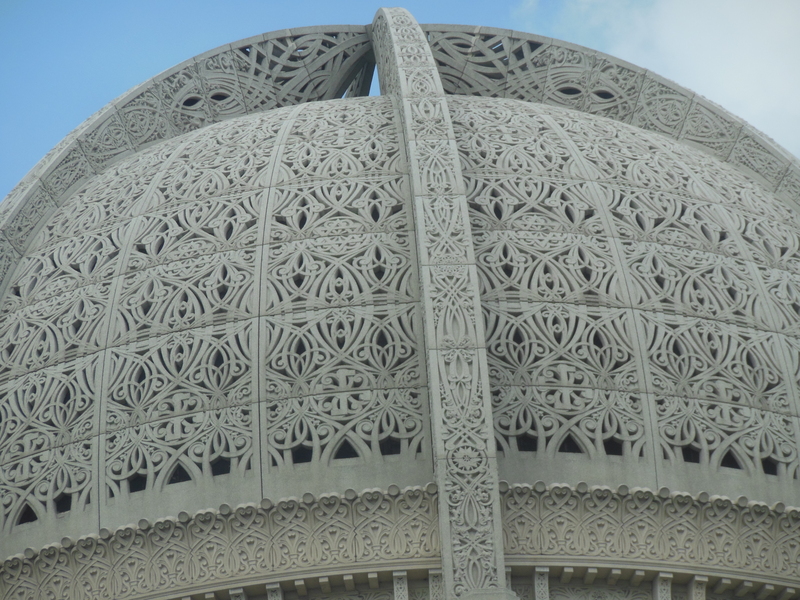 What the heck was this Baha’i temple reminding me of? Finally, I got it—-it was the Disney Store! 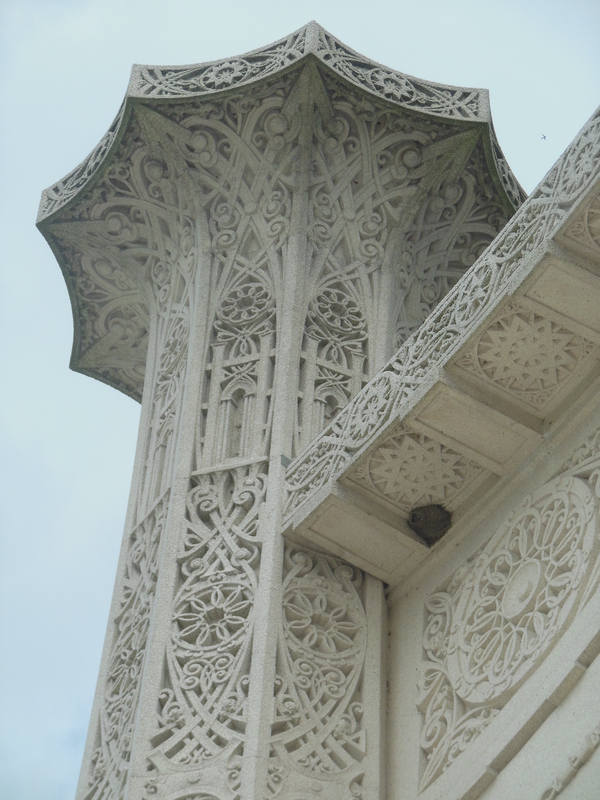 On the left is one of the nine ground level pillars of the Baha’i temple. 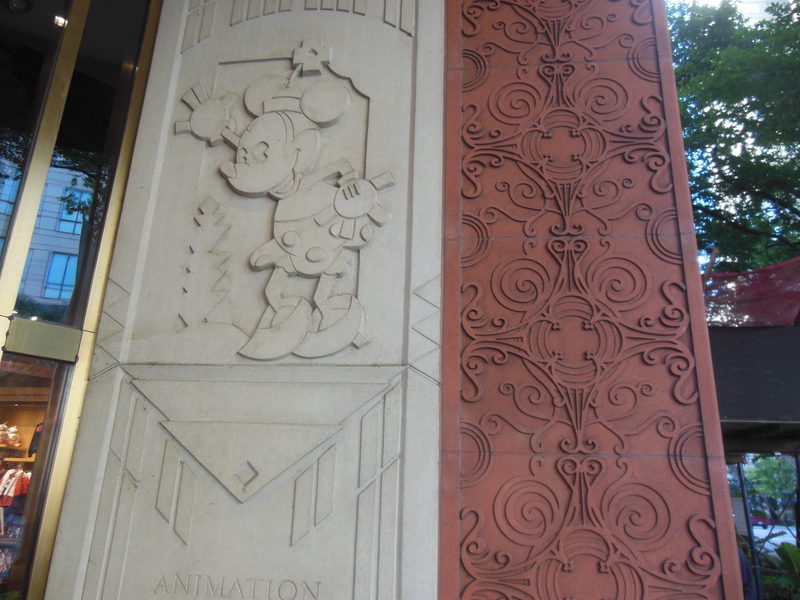 On the right is the pillar from the store front of the flagship Disney Store on Michigan Avenue in Chicago. The people I know who practice Baha’i are as sincere and lovely as the principles of their religion would suggest. I really, really want to throw myself in admiration at the foot of one of the nine symmetrical staircases and say “This is it! The most perfect religion ever!” And yet, the art historian and lover of world culture in me just says, “Meh, Disney religion.” It’s like reading a novel where everyone is nice and gets along, and there’s no crisis of character or tragic circumstances. That’s a great life, but a deadly boring book. What’s a religion without insecure gods, incestuous origin stories, contradictory and antiquated law and bloodthirsty art? Something tells me that if such an admirable religion exists, it would build a temple in honor of dignity, equality, symmetry and the number nine. How we got to Wilmette: train. Where we slept: at home. Price: mortgage, assessments and utilities. Recommended: highly. We visited the Bahai this weekend too 🙂 Lovely pictures. Thank you nikirath—I hope you had time for lots of interesting architecture in the Chicago area! Oh yes of course—shout out to my Unitarian Universalism friends! I used to drive by this every day on my way to work and thought it was so beautiful! I never had the chance to see it up close though so I loved all your photos! Didn’t know how good their bathrooms were – a good thing to remember, I think! I am going to visit Chicago for the first time in October, I will add this to my list of places I want to visit! 9 time 3: love it! Have you been inside the Delhi temple Sreejith? Looks so serene.I had been to the Baha’i temple in Delhi.It is popularly known as the Lotus Temple.A beautiful structure and surroundings. 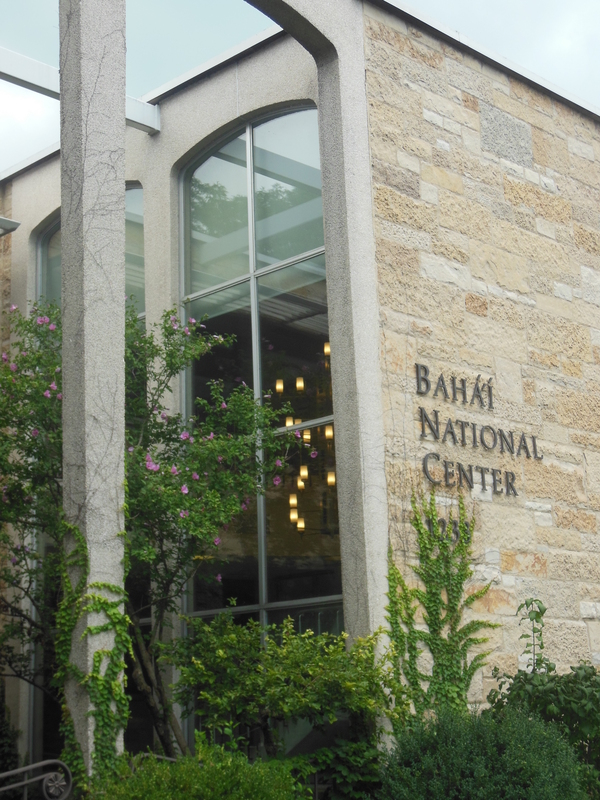 I just met someone earlier this week who just returned from being a volunteer at the Baha’i center in Israel. She said there are lots of pilgrims. I wonder if it’s the same in Delhi? I saw a lot of tourists there.It has become a must see place in Delhi.Volunteers were seen over there also.Since they don’t have a specific dress code I couldn’t make out the pilgrims or followers. 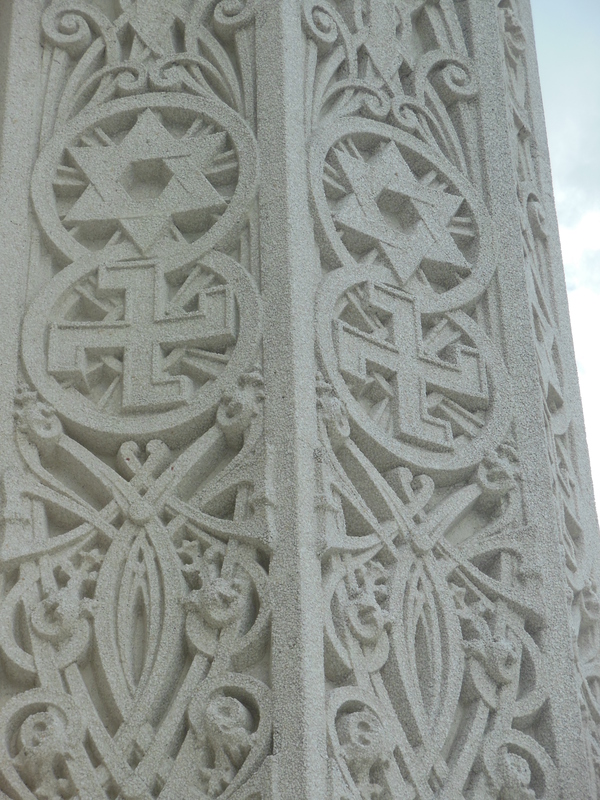 Been to the Bahai temple in Haifa. They do have a few traits found in other religions like “we’re the most correct” and “it all points to us”, plus in early Bahai history there was actually some violence over successors etc. That said I did think their Haifa building was quite beautiful and tastefully done, and they were pleasant enough. I’m waiting for a religion to come along whose motto is “Meh, what do we know? Maybe we’re wrong about this whole thing”. That will be the religion I join. The Quakers are a bit like that I think. Buddhism sometimes. 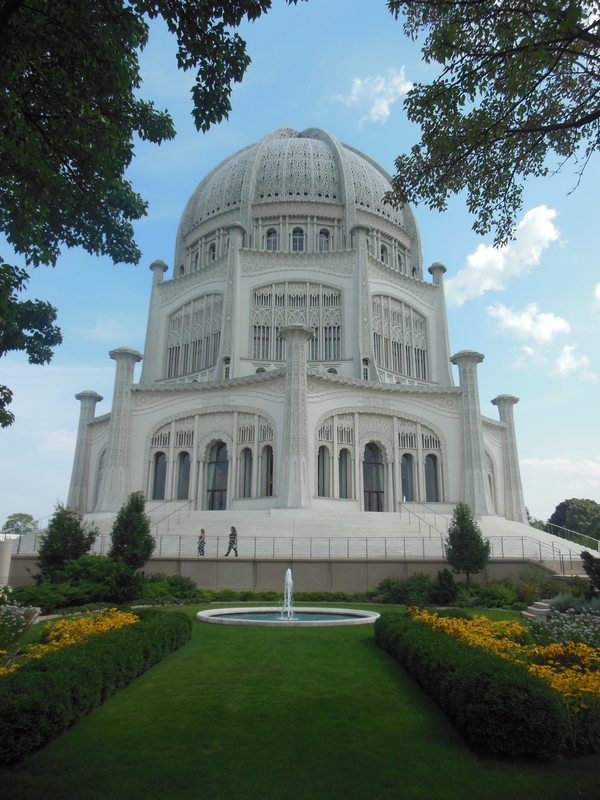 I grew up in Evanston not far from the Bahai temple, and we always used to take visitors there because it was the closest tourist attraction to our house. But there was no such thing as a Disney Store in those days, so I can’t compare. I know a couple of Bahai adherents here in Frankfurt, and I have the impression that Bahai is similar to the Cao Dai religion in Vietnam. This is the first I’ve heard of Cao Dai so I googled it—it looks quite colorful. I hope you can visit Evanston again some day. It is an interesting city, with the University of course, but lots of weird stuff like a million oriental rug stores. ← If I show you my vibrating alarm clock will you think I’m getting fresh with you?